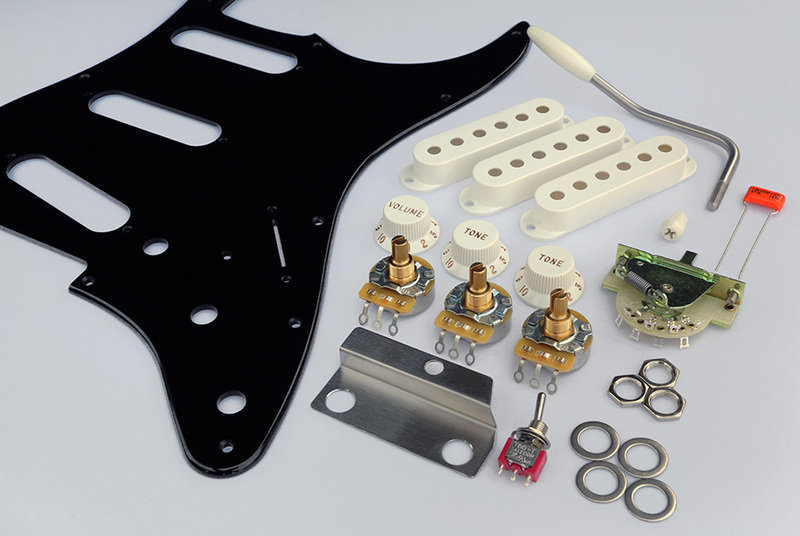 All The Components Included In This Basic Black Strat Pickguard Assembly Kit - Parchment Accessories Shown. 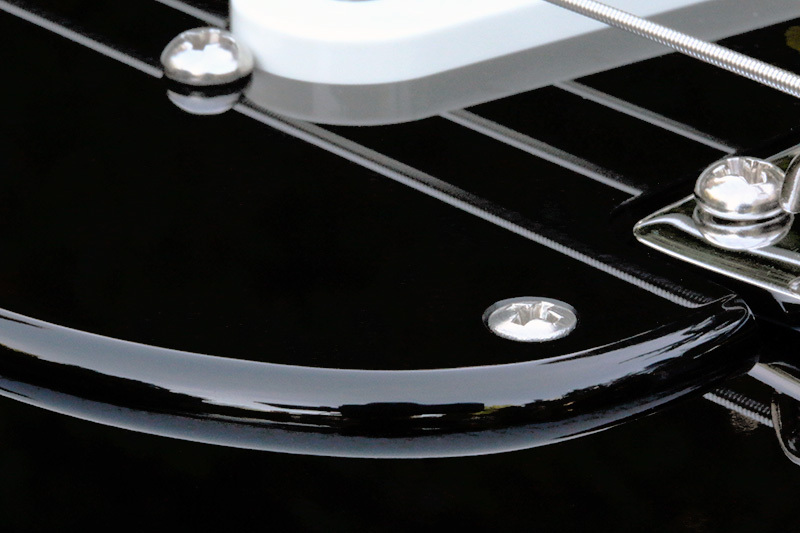 Close-up detail of the Acrylic pickguards rounded and polished perimeter edge, shown mounted on completed guitar. The rounded and polished pickguard edge is only available on our Black or White Acrylic 1 Ply 0.120" pickguards as offered within this pickguard assembly kit. 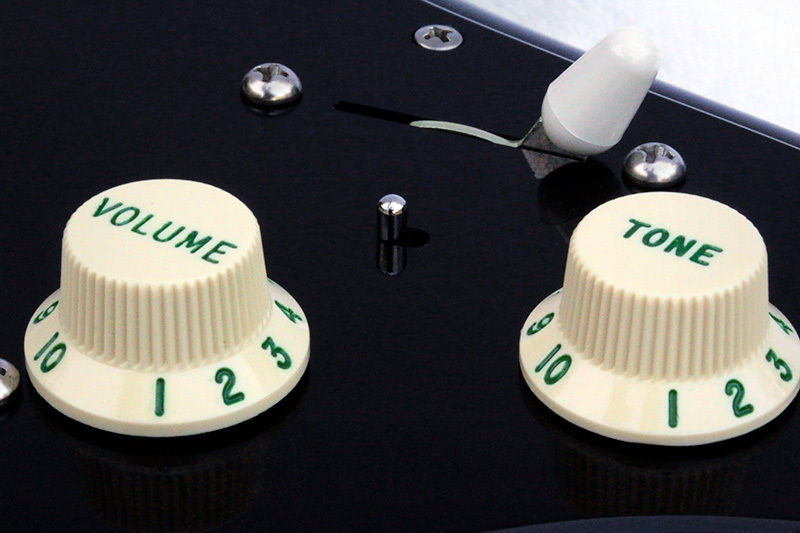 Close-up detail of the recessed mini-toggle switch / neck pickup selector. Notice the implementation of the mini-toggle switch and the very small slot in the pickguard that allows the toggle lever to protrude through. Also shown are the optional customized Green Lettered and Numbered knob set, additional $25.00. Each of the 5 pickguard selection options are our own custom manufactured 0.120" Acrylic 1 Ply pickguards with the Rounded and Polished Perimeter Edge. They are available in black or white. 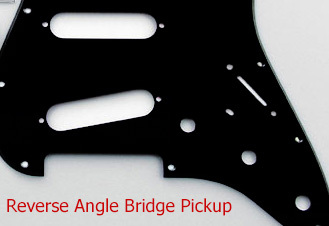 For a limited time we also have a reverse angle bridge pickup black Acrylic pickguard, see full description below. We offer a number of accessory color options for this kit. The accessories consist of the pickup covers, knobs, switch tip and tremolo arm tip. We offer the standard colors such as white, parchment, aged white and black. We also offer an option called "Combination", this combination option is the same as found on the Custom Shop Relic Gilmour Black Strat where the knobs are Aged White and the pickup covers, switch tip and tremolo arm tip are Parchment. To further accurately reproduce this Relic version we can customize your knob set with the Dark Green Letters and Numbers for an additional $23.00. To get a feel for the combination accessory colors with the dark green letters and number check out our Black Strat #6 build project. To accurately reproduce the NOS version select Parchment for the accessory color. Pickguard - Your choice of 1 of the following 5 custom manufactured 1 ply 0.120" Acrylic pickguards with the rounded and polished edge. Pickup and selector switch mounting holes are not countersunk and require round head mounting screws. Copper foil shielding in the control region only. Parchment - Select this option for NOS Black Strat style. Standard - Gold letters and numbers for the white, parchment and aged white knob set and white letters and numbers for the black knob set. Green Letters and Numbers - Custom option where we customize the knob set - $25.00 additional. Custom manufactured stainless steel recessed mini toggle switch mounting bracket. Three CTS 450G series vintage style low rotational torque 250k audio taper split shaft potentiometers. 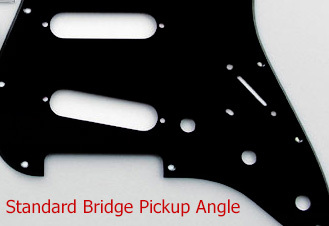 Black Strat® wiring diagram with neck/bridge pickup modification. We will provide you with the Black Strat® specific wiring diagram via email after order placement (when your order is invoiced).